"I do not agree with what you say, but I will fight so that you can say it." I am a fan of English grammar. Check out some common errors if you'd like. While you're here, read what some people are saying about the site! Also, if you are a student enrolled in Physics 1110 or Physics 1120 at the University of Colorado at Boulder, you may find the CAPA Help Page useful. Well, it was time for some changes around here. The most obvious, of course, is the new look to this web site. To the right are images of the way this website used to look. 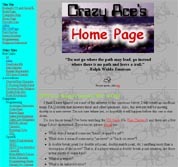 Cascading Style Sheets (CSS) caught my interest and I decided to play around with them some. This web site is my first attempt at using them. Also, I have moved the web site to a new server which should be valid indefinitely now. 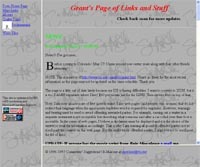 Make sure all your links and bookmarks are changed to http://www.gantless.com. A lot of new content has been added, broken and old links removed, and new links added. I graduated from the University of Colorado at Boulder in May 2003 (Go Buffs!). I then went on a European vacation. It was the greatest time of my life. I was one of the people who booked the trip literally two weeks before the departure date. It wasn't an impulsive move; I had been thinking about going for a couple of years. 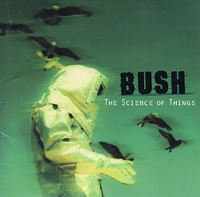 But I just hadn't made the final decision until that time (the war with Iraq had some influence as well). I flew into London, took the Eurostar into Paris, and took an overnight train to Rome. I then rode in a bus to Pompeii, Sorrento, and across Italy to Bari before taking a cruise to Greece. I was on the Greek island of Poros for a few days before ending up in Athens. I went with 51 other college graduates from across the country and didn't know anyone before I left. I met a lot of great people. Check out the pictures. Check out "Independent Woman" played by Kittens. It's awesome. The xylophone kitten is the best. Also, if you haven't checked out Strong Bad's E-mail, now would be a good time to do so. Have you read the comic strip "Get Fuzzy" lately? It is the funniest strip I have ever read. It is about a man living with his two pets: a cat named Bucky and a dog named Satchel. If you like it, write to the editor of your local newspaper and ask them to carry it. 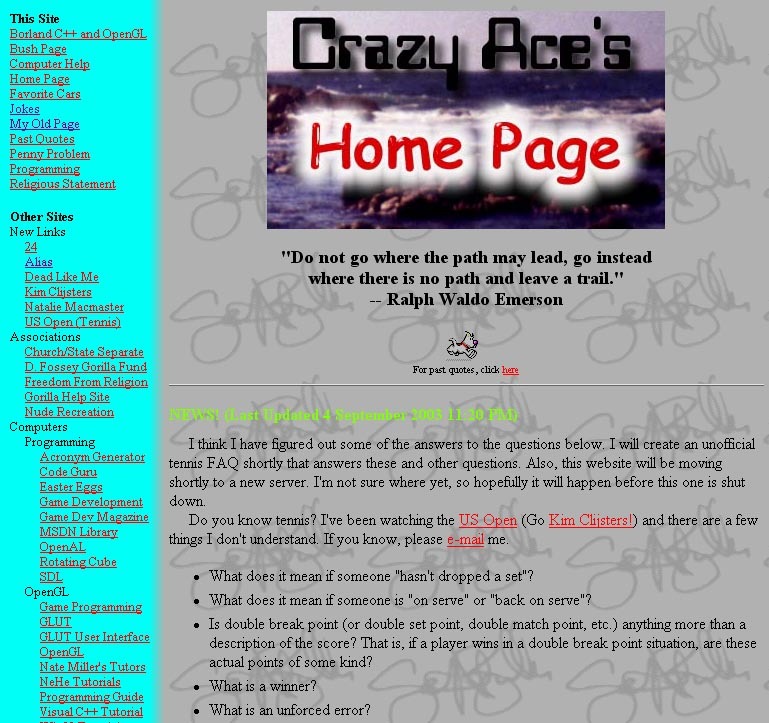 So why "Crazy Ace"? This is kind of a second nickname I had in high school that never really caught on outside of people in my math classes. It was actually during my sophomore year when I went to study for a trig test at my friend Brooks' house. He lived far away and I couldn't yet drive, so I caught a ride with a girl named Autumn who was also going to study. (On a side note, when I moved away from home, I found a pottery mug that she gave me at the end of the year. Thanks, Autumn!) Anyway, at one point in the night we got pretty tired of studying and decided to play a game of ping-pong. I think the game started off as a type of "around the world," but at some point I just smacked the hell out of the ball. This kind of freaked some people out as a departure from my normal, quiet composure. Someone blurted out something like "Easy there, Crazy Ace," and the name stuck. Then what about "Gantless"? This came from my friend Chad while we were practicing for the golf team during my freshman year of high school. The frame of the pair of eye glasses I wore at the time was manufactured by Gant. He looked at it and said "Gantless." I don't know why, exactly, but it stuck. No, I did not drop the 'r' from my name, and NO it's NOT spelled Gauntless! Current Book: The book I'm currently reading is Harry Potter à l'école des sorciers by J. K. Rowling and translated by Jean-François Ménard. Last Concert I Attended: Natalie MacMaster in Smothers Theatre at Pepperdine University in Malibu, California on April 28, 2006. Number Two Fear: Claustrophobia. I don't mind tight spaces so much as long as I am in control of when I can get out. Being buried alive would probably be my greatest fear of death as I would be alive but unable to move. My friend Dan and I went on a tour of Chichén Itzá, the Mayan ruins on the Yucatan Penninsula near Cancún, Mexico in Spring 2001. The El Castillo pyramid was actually built over a smaller pyramid. 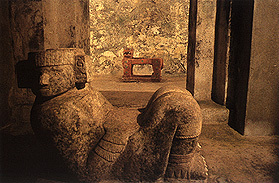 You can go in-between the two pyramids to see a Chac Mool as well as a jaguar sculpture with jade eyes. However, it is very cramped and unbearably humid in the tunnel. I nearly lost it in the tunnel because you barely had enough room to walk one way down the tunnel, so to get out, you first have to walk all the way in and turn around. I was not able to find a photo of the tunnel, but trust me; it's small. You are not supposed to photograph the statues due to the flash destroying the color. Interestingly, there is no such restriction inside the Louvre. Cats or Dogs? Cats. Cats are wonderful animals. Unfortunately, I am allergic to them. The only problem I have is if their fur or dander or whatever particles get transfered to your hand when you pet them ends up in my eyes. Robert De Niro said it best in Meet the Parents: "The dog is an emotionally shallow animal... But cats make you work for their affection. Cats don't sell out like dogs do." Favorite Fruit: Strawberries. But for a more exotic twist, I prefer Kiwi or Mango.